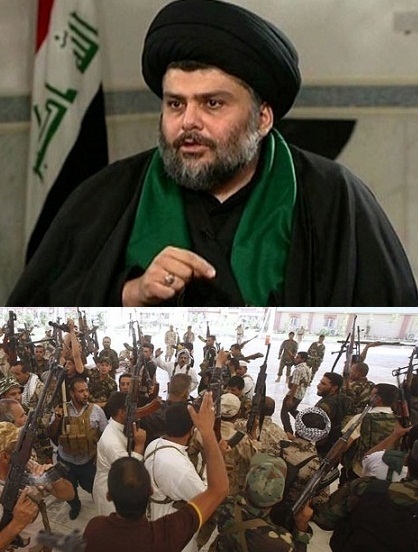 JNN 27 June 2014 Baghdad : Iraqi powerful cleric Muqtada al-Sadr pledged to defeat extremist and Takfiri terrorists while voicing strong opposition to another US military presence in the country. On Wednesday, Sadr ruled out any intervention by the United States in Iraq and pledged to stop assaults by terrorists of the al-Qaeda splinter Islamic State of Iraq and the Levant (ISIL). “We will shake the ground under the feet of ignorance and extremism as we did under those of the occupation,” Sadr said in a televised speech from the holy city of Najaf. Sadr’s remarks came days after his supporters paraded in the Sadr City, situated in the north of the capital Baghdad. The Iraqi army continues mop-up operations against Takfiri terrorists of the so-called Islamic State of Iraq and the Levant (ISIL) in the east and north of the country. Iraqi troops have taken control of the main road between the capital Baghdad and the holy city of Samarra, the army officials said on Wednesday. The achievement followed a fierce battle against terrorists from the ISIL in the eastern province of Diyala. The Iraqi military also said troops gunned down an unspecified number of terrorists and destroyed nearly a dozen of their vehicles during the operation near Samarra. The military sources added the army still maintains full control of the key oil refinery in the town of Baiji in northern Salaheddin Province after engaging in heavy clashes with the terrorists. The sources added that troops have repelled an attack on the refinery at dawn. However, ISIL Takfiri militants claimed they have taken control of the oil refinery in Baiji. Takfiri terrorists have been attacking Baiji refinery, which produces a third of the country’s oil output, for the past ten days. Earlier reports said the terrorists destroyed some oil stores of the refinery. On June 10, the ISIL militants took control of Mosul, the capital of Nineveh Province. They later took control of the city of Tikrit, located about 140 kilometers (87 miles) northwest of Baghdad. Iraqi Prime Minister Nouri al-Maliki has said that the country’s security forces would confront the terrorists, calling the seizure of Mosul a “conspiracy.” The Iraqi prime minister has also blamed Saudi Arabia and Qatar for the security crisis and growing terrorism in his country, denouncing Riyadh as a major supporter of global terrorism. Soldiers of the Iraqi army have been engaged in heavy fighting with the terrorists in different fronts and have so far been able to push back terrorists in several areas. This entry was posted in Iraq News, Middle East and tagged Baghdad, Iraq, Islamic State of Iraq, Muqtada al-Sadr, Sadr, takfiri. Bookmark the permalink.